﻿Contact us and we will inspect your property for any damages and provide recommendations. We will also meet with your insurance adjuster during their inspection if requested. 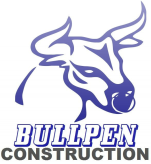 With over 15 years of experience, Bullpen Construction is a residential company offering a full range of services. We produce quality craftsmanship, offer reasonable prices, and honest service. We have the knowledge and expertise to handle any size project. We aim to please and want all of our clients to be completely satisfied. We stand behind our work 100%! !